Patriots Day is a 2016 American action drama film based on the 2013 Boston Marathon bombings and the subsequent terrorist manhunt. Directed by Peter Berg and written by Berg, Matt Cook, and Joshua Zetumer, the film is based on the book Boston Strong by Casey Sherman and Dave Wedge. It stars Mark Wahlberg, Kevin Bacon, John Goodman, J.K. Simmons, Michelle Monaghan, and Alex Wolff. It marks the third collaboration between Berg and Wahlberg, following Lone Survivor and Deepwater Horizon. Principal photography began on March 29, 2016, in New York City, and also filmed in Boston, Los Angeles, New Orleans and Philadelphia. The film premiered on November 17, 2016, at the AFI Fest. Distributed by CBS Films and Lionsgate, Patriots Day was released in Boston, New York and Los Angeles on December 21, 2016, followed by a nationwide expansion on January 13, 2017. The film was a box office disappointment, grossing just $50 million worldwide against a production budget of $45 million, but it also received many positive reviews for Berg's direction and the performances of its cast, and was chosen by the National Board of Review as one of the top ten films of 2016. The title refers to Patriots' Day, the Massachusetts state holiday on which the Boston Marathon is held. The movie begins on April 14, 2013, a day before the marathon. The next day, brothers Dzhokhar and Tamerlan Tsarnaev detonate two bombs during the Boston Marathon, causing widespread panic. A young couple, Patrick Downes and Jessica Kensky, are injured and taken to separate hospitals, where they are both required to have their legs amputated. Steve Woolfenden, a family man, is also injured and separated from his toddler son, Leo, who is taken by the police to a safe location. FBI agent Richard DesLauriers is assigned to investigate the bombings in collaboration with Boston police commissioner Ed Davis,while Police Sergeant Tommy Saunders searches for evidence and helps people that have been injured or separated from their loved ones in the chaos, including Patrick, Jessica, Steven and Leo. FBI analysts review footage of the bombing and identify Dzhokhar and Tamerlan as suspects, but DesLauriers is reluctant to release their pictures to the public without further evidence. His hand is forced when the pictures are leaked to the press, while Pugliese's men begin conducting door-to-door searches for the pair. Dzhokhar and Tamerlan kill officer Sean Collier in a failed attempt to steal his sidearm, and then carjack student Dun Meng, telling him of their plans to conduct another bombing in New York City. Just as Dzhokhar enters the Shell Gas station convenience store, Meng quickly escapes the car and runs to the Mobil Gas Station so that he can call the police; the brothers flee in the stolen car. Saunders arrives at the scene, learns of the brothers' plan and is given the stolen car's GPS tracking number, leading police to the pair, which leads to an armed and epic confrontation. The ensuing shootout where the brothers use both firearms and bombs, sees several officers injured. While Tamerlan is shooting, Watertown Police Sergeant Jeffrey Pugliese fires at his ankle, wounding him and hindering his ability to gather more explosives. Tamerlan orders Dzhokhar to run to New York City to continue the rampage while he makes a last stand. As Tamerlan is subdued by the police, Dzhokhar runs over his brother in his flight, killing him as he escapes in the chaos. Meanwhile, Tamerlan's wife Katherine Russell and Dzhokhar's college friends are detained by the FBI Hostage Rescue Team and questioned by the High-Value Interrogation Group. Katherine refuses to disclose any knowledge of her husband's illegal activities, paraphrasing the Quran in defiance, while Dzhokhar's friends appear oblivious to his plans, despite having earlier found bomb components in his possessions. A local man named David Henneberry later finds Dzhokhar hiding under the sheets of his boat and calls the police. Dzhokhar is quickly surrounded and arrested after a brief standoff, as Saunders and his colleagues celebrate. The Boston police are invited to attend a Boston Red Sox game, where David Ortiz thanks them for their heroism and tells them to "stay strong". Dzhokhar was convicted on thirty counts and sentenced to death by lethal injection and is currently waiting for his appeal in federal prison; his three college friends were arrested for obstructing the bombing investigation and authorities are continuing to seek information regarding Russell's possible involvement in the bombings. This film also includes a cameo appearance of the real Dun Meng inside the pizza restaurant in Malden, Massachusetts, as well as the real David Henneberry, who was outside for a short time during the search for the bomber. Ken Casey, singer and bassist for Boston punk band Dropkick Murphys, also has a cameo as a man on a porch. The film was one of what had originally been three proposed about the bombings, the other two being Boston Strong (based on the book of the same title), set to be directed by Daniel Espinosa and star Casey Affleck, and Stronger, about bombing victim Jeff Bauman, starring Jake Gyllenhaal. It was to depict Boston Police Commissioner Ed Davis' experiences during the manhunt. CBS Films purchased the rights to Boston Strong and merged it into the existing script. Stronger was made as a separate film, and released on September 22, 2017. On March 31, 2015, CBS Films announced that it was producing the film as Patriots' Day, depicting the 2013 Boston Marathon bombing and manhunt. The film's script was written by Matt Charman, and focused on Boston Police Commissioner Edward F. Davis. The film is also based on the book Boston Strong and material from 60 Minutes. Its final version, not focused specifically on Davis, was written by Peter Berg, Matt Cook, and Joshua Zetumer; Mark Wahlberg plays police officer Sgt. Tommy Saunders and Michelle Monaghan plays his wife, Carol. Wahlberg produced the film along with Scott Stuber, Dylan Clark, Stephen Levinson, Michael Radutzky, Hutch Parker, and Dorothy Aufiero. 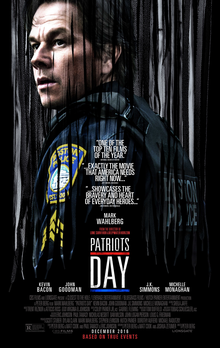 By February 2016, the title had dropped the apostrophe to become Patriots Day. Also by then, J. K. Simmons had joined the cast as Watertown PD Sgt. Jeffrey Pugliese. CBS Films and Lionsgate co-financed the film, with Lionsgate also handling distribution. On March 8, 2016, Jimmy O. Yang joined the film's cast to play Dun Meng, who was carjacked by the Tsarnaev brothers. On the same day, Vincent Curatola was cast to play the mayor of Boston, Thomas Menino, who was in office for his fifth term when the bombings took place. On March 11, 2016, John Goodman signed on to play former Boston Police Commissioner Ed Davis. On March 25, 2016, James Colby joined the film to play William B. Evans, a Boston PD superintendent, and following him, Michelle Monaghan also joined the film, to play Carol Saunders, Tommy's wife. On March 31, Kevin Bacon joined the cast as FBI agent Rick Deslauriers, and on April 4, 2016, Alex Wolff and Themo Melikidze were cast in the film as Dzhokhar and Tamerlan Tsarnaev, responsible for the bombing and later manhunt. Michael Beach later joined the film to play the Governor of Massachusetts Deval Patrick. On April 6, 2016, Rachel Brosnahan and Christopher O'Shea joined the film to play newlyweds Jessica Kensky and Patrick Downes, who were at the finish line, and were both seriously injured but survived. The following day, Lana Condor was cast in the role of Sean Collier's prospective girlfriend. On May 5, 2016, Melissa Benoist was cast in the film to play Katherine Russell, the widow of Tamerlan Tsarnaev, with Khandi Alexander set to play a law enforcement interrogator Veronica, Jake Picking as MIT Police Officer Sean Collier, who was killed 79 hours after the bombing. David Ortiz, who retired from the Boston Red Sox after the 2016 season, appears as himself. Principal photography began on March 29, 2016, in Quincy, Massachusetts with production offices and a soundstage set up in one of the Centennial Park warehouses in Peabody, Massachusetts. All interior scenes at the FBI warehouse headquarters, as well as exterior 'command tent' scenes, were shot there. Filming was previously scheduled to take place on Laurel Street in Watertown to recreate the shootout that took place between police and the Tsarnaev brothers on the actual location, but after objections by residents, town officials denied permission for the film to be shot there. The City of Malden was approached to stand in for Laurel Street, and ended up with eight locations in the film. The film crew then approached University of Massachusetts Dartmouth officials for permission to shoot some scenes at the campus, a request that was denied by its chancellor, Gerry Kavanaugh. Simmons College stood in the place for exterior shots of UMass Dartmouth. The Massachusetts Institute of Technology, where the Tsarnaev brothers killed MIT Police Officer Sean Collier, had allowed the film production to shoot "entirely peaceful scenes" on the campus for three days in June. Filming also took place at Collier's actual house. The marathon finish line on Boylston Street was duplicated at the Naval Air Station South Weymouth, in addition to scenes filmed at the actual finish line on the day of the 2016 marathon. Dzhokhar's capture was filmed in Framingham, Massachusetts on its third anniversary. Additional filming was conducted at Doyle's Cafe in Jamaica Plain on April 14, 2016, Watertown, Massachusetts for shots of the police station and the sequence depicting Dun Meng escaping to the Mobil Gas station unlike the surveillance footage which was shot in Cambridge, Massachusetts, and at Lasell College in Newton, Massachusetts on May 18, 2016. Academy Award-winning composers and Nine Inch Nails members Trent Reznor and Atticus Ross were hired to write the musical score for the film. "Forever (2007 version)" by Dropkick Murphys plays during the closing credits of the film however is not included on the film's soundtrack. Patriots Day premiered on the closing night of the AFI Fest on November 17, 2016. It had a red carpet premiere at the Boch Centre Wang Theatre on December 14, 2016. The film was released in New York, Boston, Los Angeles, New Orleans, Philadelphia, Sofia, Bulgaria and Paris, France on December 21, 2016, followed by a wide release on January 13, 2017. Patriots Day grossed $31.9 million in the United States and Canada and $18.5 million in other territories for a worldwide total of $50.5 million, against a production budget of $45 million. In North America, the film had its expansion alongside the openings of Monster Trucks, The Bye Bye Man, and Sleepless, as well as the wide expansions of Silence and Live by Night, and was expected to gross $18–20 million from 3,120 theaters in its four-day MLK opening weekend. It made $560,000 from Thursday night previews, less than the $860,000 made by Berg and Wahlberg's Deepwater Horizon in September. The film ended up opening to $12.9 million (a four-day total of $14.2 million), finishing below expectations and 6th at the box office. On review aggregator Rotten Tomatoes, the film holds an approval rating of 80% based on 215 reviews, with an average rating of 6.8/10. The website's critical consensus reads, "Patriots Day offers a stirring, solidly crafted tribute to the heroes of a real-life American tragedy without straying into exploitative action thriller territory." On Metacritic, the film has a normalized score of 69 out of 100, based on 42 critics, indicating "generally favorable reviews". Audiences polled by CinemaScore gave the film an average grade of "A+" on an A+ to F scale, one of fewer than 80 films in the history of the service to receive such a score. Though the film has mostly garnered approval among critics, many Boston-based publications criticized it for glamorizing the events it was based upon, and for the film's focus on Wahlberg's fictional character. In his review for The Boston Globe, Ty Burr wrote: "It’s professionally made, slickly heartfelt, and is offered up as an act of civic healing. At best, it’s unnecessary. At worst, it’s vaguely insulting", and when further referencing local moviegoer's reaction to Wahlberg's heroic but fictional Tommy Saunders character, he simply stated, "We don’t really want to see people who weren’t there. Especially when they’re everywhere" Writing for Esquire, Boston-based critic Luke O'Neil also criticized Wahlberg's character, stating: "For all his talk of honoring his people, Wahlberg seems content to rely on the most hackneyed of Masshole signifiers in their portrayal." Conversely, The Boston Herald gave the film a positive review. In response Peter Berg stated that some people automatically disliked the film as they may have been in close proximity to the Boston bombings or they believed the film was made too quickly after the events had occurred. Katharine Q. Seelye, who was not from Boston, wrote in The New York Times that the Saunders character was "[t]he biggest point of divergence", as Boston-area residents disliked the composite character's involvement in all the major events when he was not a single actual person, while people not from the Boston area "may even appreciate [Saunders] as a narrative device" and "have not really questioned" Saunders's role. She concluded "that moviegoers outside New England pretty much accept the film on its own terms, as entertainment, and Bostonians do not." ^ a b "Patriots Day (15)". British Board of Film Classification. December 14, 2016. Retrieved December 14, 2016. ^ a b c "Patriots Day (2016)". Box Office Mojo. Retrieved August 2, 2017. ^ Kenneth Turan (20 December 2016). "'Patriots Day' finds Mark Wahlberg and Peter Berg at their best in a fine tribute to the people of Boston". latimes.com. Retrieved 20 January 2017. ^ "National Board of Review Announces 2016 Award Winners". National Board of Review. November 29, 2016. Retrieved November 29, 2016. ^ a b Kit, Borys (March 11, 2016). "John Goodman Joins Mark Wahlberg in Boston Marathon Bombing Movie 'Patriots Day'". The Hollywood Reporter. Retrieved March 12, 2016. ^ a b c d Hipes, Patrick (February 25, 2016). "J.K. Simmons Joins Boston Marathon Bombing Pic 'Patriots Day'". Deadline Hollywood. Retrieved February 26, 2016. ^ "Official movie synopsis". Retrieved 28 August 2017. ^ a b c Pedersen, Erik (March 29, 2016). "Michelle Monaghan Joins 'Patriots Day'". Deadline Hollywood. Retrieved March 31, 2016. ^ a b c Sneider, Jeff (April 4, 2016). "Alex Wolff, Themo Melikidze to Play Boston Marathon Bombers in 'Patriots Day'". TheWrap. Retrieved April 5, 2016. ^ a b McNary, Dave (April 4, 2016). "Michael Beach to Play Gov. Deval Patrick in 'Patriots Day'". Variety. Retrieved April 5, 2016. ^ a b Pedersen, Erik (March 25, 2016). "Vince Curatola Sworn In As Boston Mayor For 'Patriots Day'". Deadline Hollywood. Retrieved March 28, 2016. ^ a b "James Colby Joins Mark Wahlberg's Boston Marathon Bombing Drama, 'Patriots Day'". The Hollywood Reporter. March 25, 2016. Retrieved March 28, 2016. ^ a b c d Sneider, Jeff (May 5, 2016). "Melissa Benoist to Play Boston Marathon Bomber's Widow in 'Patriots Day'". TheWrap. Retrieved May 6, 2016. ^ Chinese name from: "《爱国者日》上映 再现波马爆炸案 留学生孟盾事迹搬..." The China Press. 2017-01-13. Retrieved 2018-09-22. ^ a b Pedersen, Erik (March 8, 2016). "Jimmy O. Yang Joins 'Patriots Day'; Sally Kirkland Cast In 'Most Hated Woman In America'". Deadline Hollywood. Retrieved March 28, 2016. ^ a b c Pedersen, Erik (April 6, 2016). "Rachel Brosnahan & Christopher O'Shea Join 'Patriots Day'". Deadline Hollywood. Retrieved May 6, 2016. ^ Sneider, Jeff (November 18, 2014). "Boston Marathon Bombing Movie 'Boston Strong' Rescued by Fox". TheWrap. Retrieved May 6, 2016. ^ Kroll, Justin (July 29, 2015). "Jake Gyllenhaal Circles Boston Marathon Bombing Pic 'Stronger'". Variety. ^ Stelter, Brian (April 1, 2015). "CBS to turn '60 Minutes' Segment into 'Patriots Day' Movie". CNN Money. Retrieved May 6, 2016. ^ Shanahan, Mark (November 15, 2015). "Movies on Marathon bombings are combined". Boston Globe. ^ a b Fleming Jr, Mike (March 31, 2015). "CBS Films Sets Boston Marathon Bombing Pic 'Patriots' Day'; Mark Wahlberg Eyes Police Commish Ed Davis Role". Deadline Hollywood. Retrieved April 4, 2015. ^ Busch, Anita (March 11, 2016). "John Goodman Joins Boston Bombing Movie 'Patriots Day'". Deadline Hollywood. Retrieved April 3, 2016. ^ a b Pedersen, Erik (March 31, 2016). "Kevin Bacon Joins 'Patriots Day' As Key FBI Agent". Deadline Hollywood. Retrieved April 3, 2016. ^ Cullen, Kevin (March 12, 2015). "Responsibility worked against carjacking victim Dun Meng". Boston Globe. Retrieved April 3, 2016. ^ McNary, Dave (April 7, 2016). "'X-Men' Actress Lana Condor Joins 'Patriots Day' (EXCLUSIVE)". Variety. ^ Siegel, Tatiana (May 3, 2016). "Red Sox Slugger David Ortiz to Re-enact Emotional Speech in Boston Bombing Movie (Exclusive)". The Hollywood Reporter. Retrieved May 6, 2016. ^ "Find out where Mark Wahlberg will be filming 'Patriots Day' in Massachusetts next week". On Location Vacations. March 24, 2016. Retrieved March 28, 2016. ^ "Casting Company Seeks Extras For Boston Marathon Bombing Movie". CBSLocal. March 2, 2016. Retrieved March 8, 2016. ^ "'Patriots' Day', starring Mark Wahlberg, Open Casting Call will be held in Boston next weekend". On Location Vacations. March 5, 2016. Retrieved March 8, 2016. ^ Smith, Tovia (March 25, 2016). "Filming For Marathon Bombing Movie Stirs Emotions In Boston". NPR. Retrieved March 26, 2016. ^ Burke, Alan (March 3, 2016). "'Patriots' Day' film company takes over Peabody warehouse". Salem News. ^ Palma, Kristi; Hoover, Amanda (February 23, 2016). "Some Watertown residents object to film studio's plan to reenact Tsarnaev firefight". Boston.com. Retrieved March 8, 2016. ^ Dwyer, Dialynn (February 26, 2016). "'Patriot's Day' will not film Tsarnaev shootout scenes in Watertown". Boston.com. Retrieved March 8, 2016. ^ Leibowitz, Aaron. "Movie shoots are mini-stimulus packages for Malden". Malden Observer. Retrieved 2017-01-05. ^ "Boston Marathon filmmakers want to shoot at UMass Dartmouth". SouthCoastToday.com. February 25, 2016. Retrieved March 8, 2016. ^ Dwyer, Dialynn (March 5, 2016). "UMass Dartmouth won't allow 'Patriots' Day' to film on campus". Boston.com. Retrieved March 8, 2016. ^ Shanahan, Mark (March 24, 2016). "Marathon bombing movie to film scenes at MIT". Boston Globe. Retrieved March 31, 2016. ^ "Letter to the MIT community regarding "Patriots' Day" filming". MIT. March 24, 2016. Retrieved March 31, 2016. ^ Annear, Steve (April 5, 2016). "'Patriots Day' to film at Officer Sean Collier's former residence". Boston Globe. ^ "PHOTOS: Movie set for "Patriots' Day" taking shape at SouthField in Weymouth". Wicked Local Weymouth. March 17, 2016. ^ "Mark Wahlberg Shoots 'Patriots Day' Scene At Boston Marathon Finish Line". CBSLocal. Retrieved May 6, 2016. ^ Shanahan, Mark (April 19, 2016). "'Patriots Day' films Tsarnaev capture scene in Framingham". Boston Globe. ^ "'Patriots Day' Movie Filmed at Doyle's in JP Thursday". Jamaica Plain News. April 14, 2016. ^ "'Patriots Day' films in Newton". Wicked Local Newton. May 18, 2016. ^ "Patriots Day Score Coming from Trent Reznor & Atticus Ross". ComingSoon.net. October 1, 2016. Retrieved October 2, 2016. ^ "Boston Globe article on Patriots Day premiere". Boston.com. December 14, 2016. Retrieved December 15, 2016. ^ "Mark Wahlberg's 'Patriots Day' Nabs Prime Awards Season Release". The Hollywood Reporter. March 2, 2016. Retrieved March 8, 2016. ^ "Mark Wahlberg's 'Patriots Day' and 'La La Land' to battle 'Hidden Figures' for box office win". Los Angeles Times. ^ "'Hidden Figures' Stays Smart, But Why Are So Many Movies Bombing Over MLK Weekend?". Deadline Hollywood. ^ "Patriots Day (2016)". Rotten Tomatoes. Fandango Media. Retrieved April 13, 2018. ^ "Patriots Day Reviews". Metacritic. CBS Interactive. Retrieved January 19, 2017. ^ CinemaScore [@CinemaScore] (January 13, 2017). "@realmonaghan @mark_wahlberg CONGRATULATIONS on your A+ #CinemaScore grade for @patriotsdayfilm www.cinemascore.com" (Tweet). Retrieved February 26, 2018 – via Twitter. ^ Burr, Ty (December 20, 2016). "'Patriots Day,' the Marathon bombing movie, is heartfelt and unnecessary". The Boston Globe. Boston Globe Media Partners. Retrieved December 20, 2016. ^ O'Neil, Luke (December 21, 2016). "'Patriots Day,' Review". Esquire. Retrieved December 21, 2016. ^ a b c d Selyee, Katharine Q. (2017-01-13). "'Patriots Day' Disconnect Between Bostonians and the Rest of Us". The New York Times. Retrieved 2018-09-27.